Over the Air would not be possible without the generous support of the companies and organisations who get what we do – and more importantly, what you do. It’s an important feature of Over the Air that it is FREE for all to attend – no conference budget or deep pockets required. And that means that we need all the support we can get – it ain’t cheap to host and feed 600+ people! The sponsorship opportunities include a physical presence via a ‘Lounge’ or ‘Code Clinic’ in the Mansion (Gold), a branded category in the Hackday competition (Gold), a branded presence on the Workshop Programme (Silver), your logo on our website and all marketing materials (Event), and Meal or Coffee sponsorship with branding at those times. If your company or organisation would like to get involved as a financial supporter, get in touch with margaret at overtheair dot org for more information. We’ve got 3D scanning & printing! 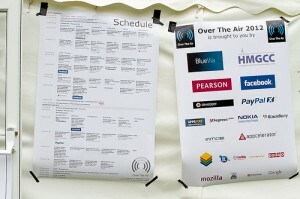 Copyright © Over the Air Events Ltd. We proudly support the Hack Code of Conduct and Diversity Charter.